There’s a war being waged in mobile. A war to control the final lucrative frontier that will shape how mobile is monetized. The battle is for mobile search, and its outcome is uncertain. Today, mobile search is a wild landscape of competing and contradictory technologies, unfulfilled promises, and 800 pound gorillas strategically positioning themselves without any centralized regulation or governance. It should be no surprise that the war for search has gone mobile as people spend more and more time on their phones. In May 2015, Google confirmed that mobile search queries overtook desktop queries. By all indications this trend will continue — comScore recently issued a report suggesting mobile search queries will grow by approximately 20% a year. Clearly, the future of search exists on a mobile device. However, mobile is not a singular platform. 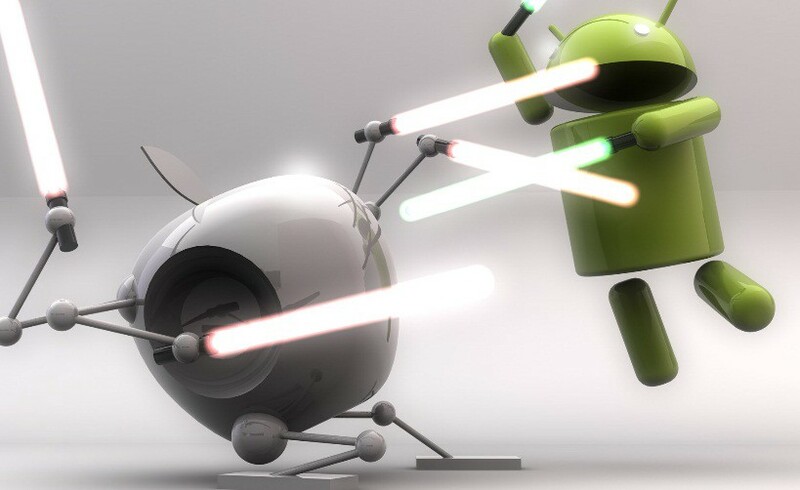 It is divided between two giants: Google’s Android OS and Apple’s iOS. It’s across this divide that the battle line is drawn. Android clearly dominates in global user base, with about 4X the number of installed devices compared with iOS: Android has nearly 2 billion smartphones in circulation while iOS has roughly 450 million. But this is not the end of the story as not all users are worth the same amount. Reportedly 75% of Google’s mobile search revenue comes from iOS. Given that Android has 4X the user base of iOS, we can calculate that an iOS user is worth 10X more than an Android user when it comes to advertising spend. Google’s attempts to draw more valuable users to Android have sputtered so far. If Google were to lose the ability to advertise to Apple’s users through their search offering, they would lose their most valuable mobile revenue source. Google realized this and paid to own the most important search bar in the iOS ecosystem: the Safari default search. According to leaked documents in the Oracle vs Google case, this was worth $1B to Google in 2014 alone. Google currently contracts to provide mobile search services to Apple. Ultimately, Apple retains control, whether through opt-out clauses or annual renewal negotiations. Apple has a history of copying successful business models on its own platform. They use the App Store as a petri dish that allows them to observe the businesses and models that work. When they see a successful app product, they will roll out a feature (usually in an iOS update), to incorporate the feature into the broader iOS platform. Google maps. RIP iOS 6 (sort of). Flashlight apps. RIP iOS 7. Fitness tracking apps. RIP iOS 8. News readers. RIP iOS 9. Google search. RIP iOS 10 (most likely). In iOS 9, Apple formally announced that they are moving full steam ahead into both web and app search. The scope of their search product offerings is limited entirely to Spotlight Search at the moment, and even more narrowly limited to app entity search: specific content within mobile apps already on your phone. However, there are clues that indicate the scope of Apple’s search roadmap. Their developer documents describe how to mark up a website for Applebot, and reference a future ‘Cloud Search’ through public indexing, where Apple will maintain a central index of web and app content for search. It’s very clear that Apple is building their own search engine of web and app content to power Spotlight. Once this is done, there’s not much stopping them from moving this functionality directly into Safari and taking control of the primary search input in iOS. It would be naive for Google to assume otherwise. As we’re very close to this space, building integrations into mobile search providers to attract apps to the Branch platform, we’ve been watching these dynamics play out for a while. 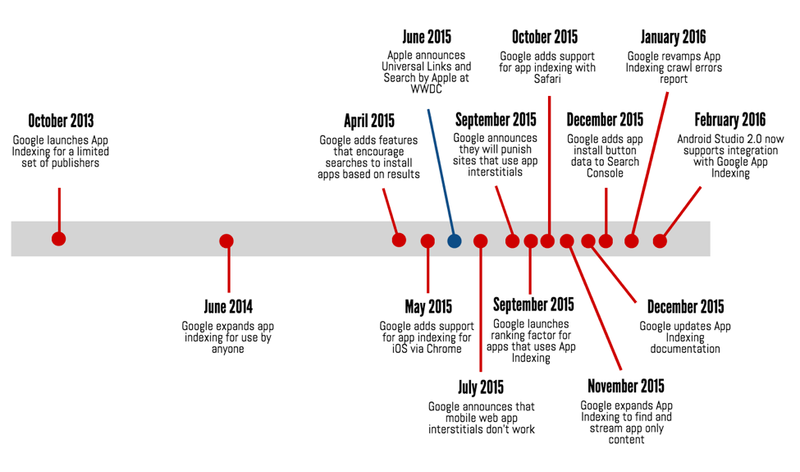 In the last 6 months, we’ve seen a burst of competitive activity between Apple and Google around search, specifically app search. It’s been amazing to observe. It all started with Apple’s launch of iOS 9 beta at WWDC where they unveiled their search plans. This clearly woke Google from a comfortable slumber, as a flurry of activity soon followed in Mountain View around mobile search, interstitials, app indexing and app streaming. In the chart below, you can see the uptick in Google’s marketing activity after Apple made the WWDC announcement. Google races to outmaneuver Apple ahead of future mobile search product launches. In order for Google to compete on iOS, they need to be able to offer the same level of app and web indexing as Apple can. Unfortunately, Apple has the clear advantage in the app indexing case since they control the more valuable OS and core app framework. This means that Google will need to do substantially more work to ensure that app data is indexed and surfaced in a relevant way to maintain parity. They’re the underdog in this case. With so much at stake, both sides are constantly trying to outmaneuver each other. Whatever long-term roadmap Apple and Google may have planned will play second fiddle to the guerrilla tactics they’ll need to win the space. For developers, this means constant feature releases, unannounced launches, and relentlessly changing requirements. As a consequence, businesses trying to use search to drive mobile adoption are left to deal with the fallout. The ultimate battleground will be the Safari search bar. Whoever owns this real estate will control mobile search and its revenue opportunity for the foreseeable future. 2016 is the year for Google to prove it’s still relevant for the future of mobile search, and it can start by maintaining control of the Safari search bar. Special thanks to Adena Hefets for her contribution to this article. I was constructed from remnants of HAL 9000 and Optimus Prime. I’m currently working on Branch links @branchmetrics to help mobile devs with app discovery. Medium's largest publication for makers. Follow to get our top stories.